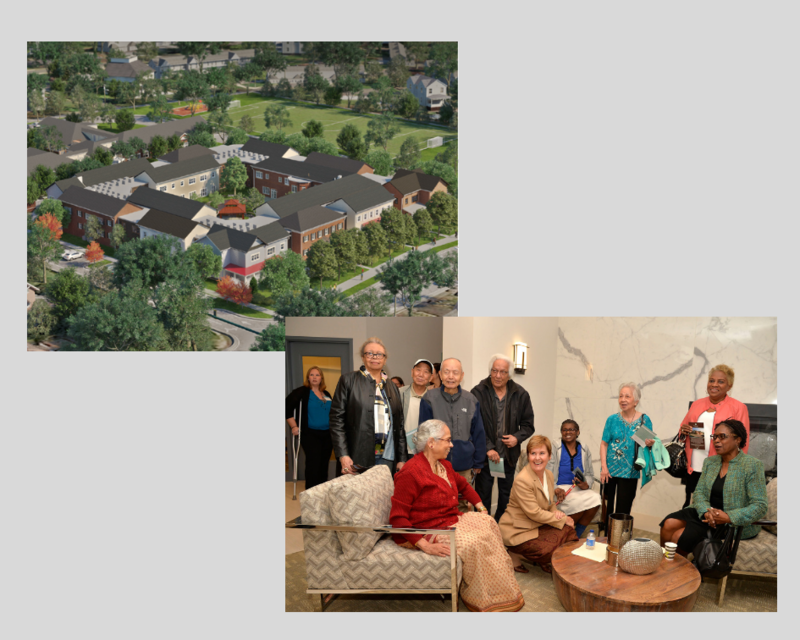 Last month several HAND members celebrated the grand opening of The Fallstead at Lewinsville Center, a senior housing community in McLean, VA. 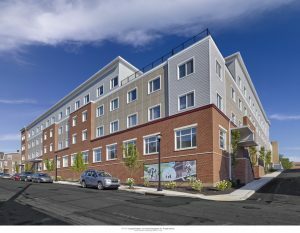 The Fallstead offers 72 one-bedroom and 10 two-bedroom modern, independent-living rental units for persons 62 years of age and older whose household income is at or below 50% of the area median income (AMI), according to a press release. Wiencek + Associates Architects + Planners served as the Architect, Hamel Builders as the General Contractor, and Wesley Housing as the Developer. Community amenities include an on-site fitness center, business center, library, a landscaped courtyard, and community garden. 10% of the units are fully accessible for individuals with mobility impairments and 2% are fully accessible for individuals with vision and hearing impairments. The community is built to Virginia Housing Development Authority (VHDA) Universal Design and EarthCraft Multifamily Platinum Design standards. Check out a full profile on the Fallstead here. HAND congratulates all the partners involved! 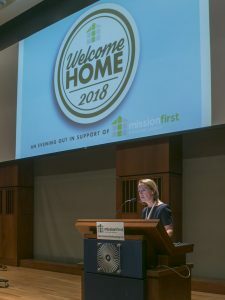 On October 4, Mission First Housing Group welcomed partners and friends in celebration of the collective efforts to provide affordable homes and support services for individuals and families in need. The event raised more than $135,000 to help Mission First expand its efforts to reach even more individuals. You can also view a special video here featuring Cassandra Gentry, a grandmother raising her grandson and great-granddaughter, who was the first resident to move into Plaza West as part of the grandfamilies program. Congratulations to the entire Mission First team on a successful event! 2018 Summer Interns from (clockwise from top left): Alexandria Housing Development Corporation, Community Preservation and Development Corporation, Wesley Housing Development Corporation and AHC, Inc.
HAND is pleased to announce that it supported four member organizations this summer by way of the Annual Internship Grant Program. 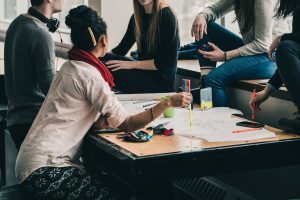 This membership benefit assists eligible nonprofit and government members in bringing on interns for their organizations, and grants students meaningful exposure to various careers within the affordable housing and community development industry. At the end of the summer, members are awarded $1,000 matching grants to offset the costs of hiring interns. The program highlights HAND’s ongoing commitment to cultivate the next generation of community development leaders. 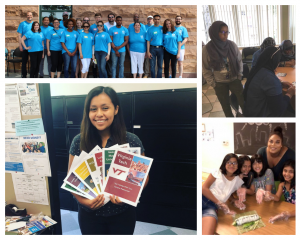 You can learn more about the program and check out summer internship experiences from previous years here. HAND: Why is affordable housing important to you? CIP: I’m proud to work for an organization that thinks holistically about addressing the ability for individuals to access key social services – from health care to education to food. Affordable housing is central to this effort since it impacts our ability to be successful in all these other areas. At the heart of the issue is the fact that affordable housing reduces financial burdens that support pathways out of poverty. When families are not overburdened with housing costs, they are not forced to make difficult decisions when it comes to other important needs. The ability to live close to employment helps contributes to building diverse and equitable communities and creates stable environments. It’s also important to realize that addressing disparities in homeownership rates is essential to reducing the racial wealth gap in the U.S. The ripple effect is profound. As access to stable, quality, and affordable housing increases, so does positive health and education outcomes. It’s a key building block to helping us achieve our mission of building communities of opportunity that break barriers to success. HAND: How did you land in the affordable housing and community development industry? 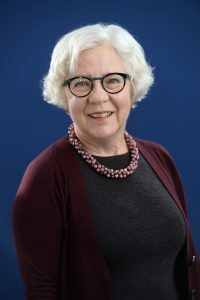 CIP: After receiving a master of public administration degree, my very first job was working for New York City’s Department of Housing Preservation and Development. I discovered that housing – beginning to end, the financing part, the physical part, all of that – really turned me on, and the mission orientation of a housing agency was what I had sought. I recognized this meant something to me in a very, very deep way. Subsequently, everywhere I worked was all about affordable housing, and it was primarily lending to build new and preserve existing affordable housing. 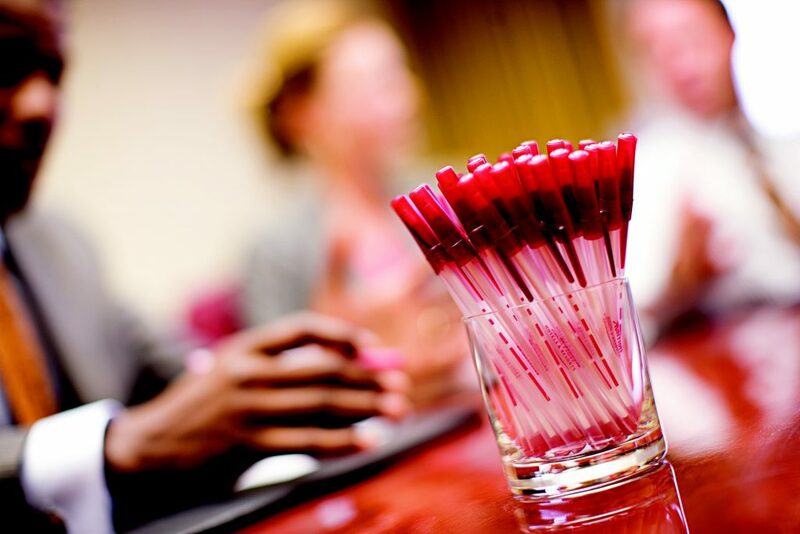 HAND: What recent accomplishment(s) is your organization extraordinarily proud of? CIP: Earlier this year, Capital Impact launched an exciting new program in Detroit called the Equitable Development Initiative. This program is designed to better ensure Detroit’s pool of real estate developers truly reflects the city’s diversity, and minority developers are able to participate in revitalization efforts. The program combines Capital Impact’s catalytic capital support, development expertise, and local knowledge to support minority developers in Detroit. We are currently providing multifamily/mixed-use real estate development training to a group of 28 individuals, a subset of whom are paired with local developer mentors and are working to further real estate development projects in Detroit neighborhoods. 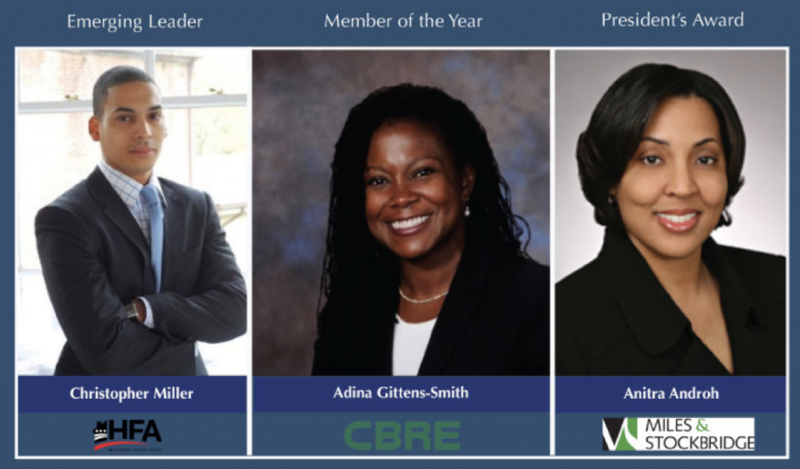 The program’s goals include supporting Detroit’s neighborhoods by connecting local real estate developers of color with opportunities to decrease vacancy, increase density, and contribute to strong, mixed-income corridors; building capacity within the local real estate development profession, specifically amongst real estate developers of color; and providing program participants with learning, technical assistance, networking, and other professional opportunities that they would not have had otherwise. We have seen so much excitement and promise around the program that we are about to launch a new application round in Detroit and are exploring the opportunity to launch similar efforts in other cities, including Washington, D.C.
Additionally, we are excited to support the preservation of affordable housing across Washington, D.C. – our backyard – in partnership with the D.C. Department of Housing and Community Development (DHCD) through the new D.C. Affordable Housing Preservation Fund. We were named as a fund manager for this effort earlier this year. Capital Impact is leveraging a $5 million investment from the city to create $20 million with the goal of preserving 300 affordable housing units in the District within the fund’s first year. The fund will revolve, creating a long-term product directed at preserving affordable housing citywide. An example of the impact we would like to have on affordable housing is our work on Terrace Manor. The property is a well-known case in Washington, D.C. The 2.2 acre, 61-unit affordable housing property in D.C.’s Ward 8 was allowed to fall into disrepair by its previous owner, leaving many low-income families in unlivable conditions including extensive mold and physical safety issues within buildings. Terrace Manor was reclaimed by the city, and WC Smith became the new developer. Capital Impact has purchased a $2 million participation in a $6.9 million loan led by LISC, to finance the acquisition of Terrace Manor. WC Smith has a long track record of facilitating developments, including the only grocery store in Ward 8. The redevelopment of the property will create more than 168 units of housing for low-income residents living below 50 percent of the Area Median Income. HAND: Have you run into any challenges over the last several months? How did you and your team overcome them? What lesson(s) did you learn? CIP: As a national CDFI, we focus on the country as a whole, but also have a local, place-based focus in several regions. That place-based focus means working with many different agencies, organizations, and partners in different locations, each of which has particular issues that it faces, different cultural contexts, and different ways of operating. These difficulties come with the territory, and we spend our days overcoming challenges to make mission-critical projects work for the communities that we serve. While that work may be slow at times, it is important to ensure our work is built from the ground up with the full input and support of local partners and communities. HAND: What are you and your colleagues looking forward to? CIP: We are most looking forward to the implementation of the D.C. Affordable Housing Preservation Fund. It will allow us to significantly increase our affordable housing investments in D.C., with a focus on preserving affordable housing that is already available. Flexible capital that can be quickly deployed will be available through the fund; this kind of flexible capital is often a good fit for the acquisition of properties that are in danger of losing their affordability. While the goal of the fund is to preserve at least 300 units in its first year, we actually think the number will be much higher because Capital Impact will leverage the city’s $5 million investment into $20 million. We are also looking forward to seeing how our Equitable Development Initiative in Detroit is supporting our program participants to engage in the city’s revitalization, and through them, creating economic and social opportunity for disinvested communities. We will be watching this closely as we think about how to implement this initiative in Washington, D.C.
HAND: What do you enjoy most about your work and why? CIP: The people that I work with! I also enjoy serving our communities and having the ability to create transformative change for often marginalized communities, some of which have suffered historical disinvestment. The fact that much of the lending we provide supports the construction of new buildings or the renovation of buildings to give them new or renewed uses means we can go out to those buildings and meet the people who now receive vital services in those buildings. That makes the benefit of our work very tangible, very fulfilling. HAND: What is one thing you learned along the way that you wish you knew at the start of your career? CIP: Recommend an action, don’t phrase it as a request for permission. And put that recommendation in the very first sentence of your e-mail or memo that offers an explanation. Many readers never get past that first sentence! HAND: What do you wish that you could change about our industry? CIP: The fact that we have to make some choices that are more conservative than what we might care to do. We have to be self-sustaining and continue to exist to do our work, which means we have to make trade-offs that make us somewhat conservative at times. HAND: If you could describe your work in one word, what would it be? CIP: Stimulating. I have worked in this industry for quite some time, so I think it is really good that this work is still interesting every day. 0 Comments/in HAND News, Member Events & Success Stories, HAND Member Profiles, Industry Highlights /by H.A.N.D. Courtesy of Don Pearse Photography | West Turner Residences in Allentown, PA, by Pennrose Properties and Sacred Heart Hospital. According to Affordable Housing Finance, this year’s competition started with 153 entries, from which 36 finalists were selected. 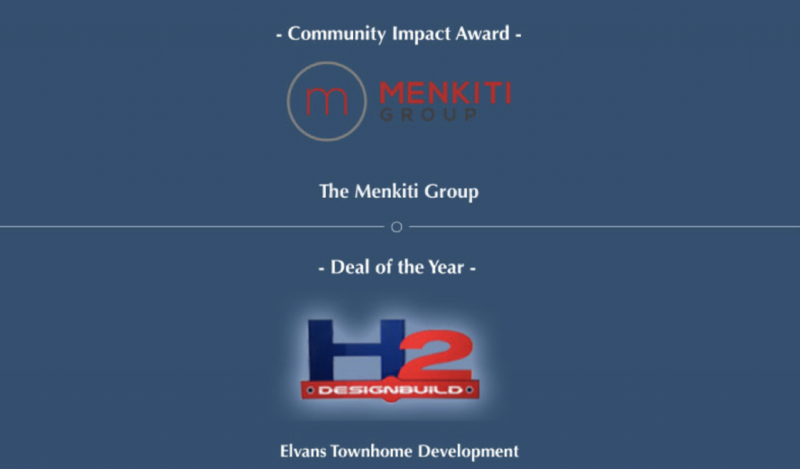 Newsletter and magazine subscribers then voted for the winners in each category plus an overall winner. An Editors’ Choice winner was also selected. For a complete listing of winners and more details, check out this article. HUD’s ConnectHome program is all about PHAs building coalitions to connect their residents to the internet, get them devices and digital literacy classes so they can have better access to opportunity. HUD and their partner, EveryoneOn are hosting a Summit in Washington, DC on Sept 17-18, 2018 for PHAs from across the country who are participating in this program. Keynote speaker Devin Wardell Cook from MIT will speak on the future of work and how technology plays a critical role. Panels and interactive sessions will offer insights from academia, HUD headquarters and the communities in the field on how to advance digital inclusion efforts. There are seats available for partner organizations that work with PHAs to attend to learn more about this opportunity. For more details, visit the following link: https://connecthomeusa.org/summitregistration2018. Online registration has closed, but on-site registration will be available.